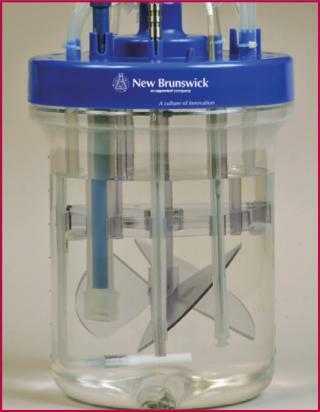 Features: New Brunswick’s disposable bioreactor is based on a traditional stirred-tank design. It was engineered for high-density cell culture scale-up with interchangeable, single-use, stirred-tank vessels in 5-L and 14-L total volume capacities and a compact controller. 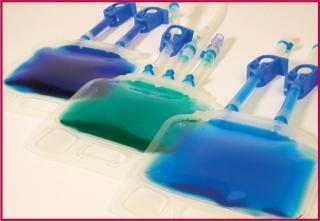 Features: Meissner’s expanded TepoFlex portfolio now includes 50-mL biocontainers. Engineered for maximum product recovery and fluid integrity in long-term storage, these containers come in three standard configurations. They are configurable with up to three ports for integration into custom assemblies tailored to end users’ specific process requirements. The company provides qualification and validation services, documentation, and application support to optimize its systems. Features: At the October 2010 Biotechnica 2010 conference in Germany, PreSens announced capabilities for two-dimensional sensing of O2, pH, and CO2 distribution. Optical technology records the sensor response of a planar foil that covers a sample surface and translates analyte content into a light signal, pixel by pixel, with a digital camera. Each image contains data from an array of single-point sensors. This noninvasive sampling and analysis uses customized software and a small (4 cm2) camera handpiece. Sensor foils can be cut and shaped with scissors. Features: Regulations for pharmaceutical products call for monitoring of possible contaminants. Sartorius Stedim provides validation services including chemical compatibility integrity testing, extractables/leachables testing, and bacterial challenge testing with a focus on regulatory compliance and cost efficiency, offering a 30-day commitment. Risk assessment examines equipment locations, the nature of products and process fluids, worst-case process parameters, pretreatment steps, and volume:surface-area ratios for process and packaging materials compatibility. Features: An enhanced Mobius 3-L CellReady bioreactor offers increased operational flexibility and improved process monitoring capabilities over the 2009 model. New features include an injection port for small-volume additions, a subsurface port for addition/removal of fluids, and an added port for insertion of a third probe. Designed to replace glass benchtop bioreactors, this system uses a standard stirred-tank format for use in development and optimization of cell culture processes. Turnaround time is reduced by the elimination of cleaning, assembly, and sterilization steps. ng. The system performs online cell counting, viability, and sizing measurements as well as HPLC titer and molecular analysis. It provides medium and carbon-source information. A steam-sterilizable sampling valve allows for continuous monitoring of critical parameters without compromising GMP sterility. 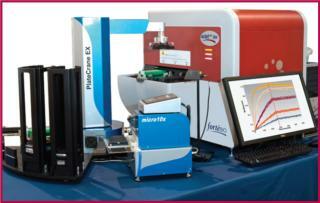 Bayer integrates Innovatis, Agilent, Shimadzu, and YSI technology into this process analytical system. Features: An expanded FitQuick product line from Colder Products Company includes hose-barb-to-hosebarb tees, straights, elbows, and Ys along with Luer locks, all in medical-grade polycarbonate material. These fittings are made for applications requiring biocompatibility, robustness, and heat resistance. FitQuik connectors feature precise hose barbs and thread forms to ensure a secure, reliable fit. 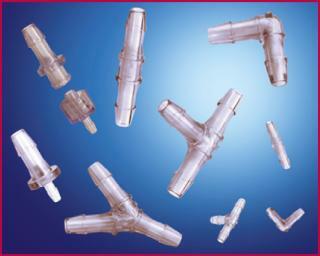 They come in nylon, polypropylene, and now polycarbonate, with fittings designed for tubing sizes from 1/16 to 3/8 in. 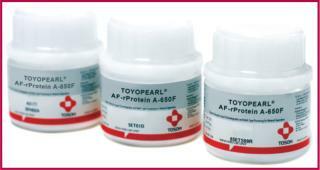 Features: Tosoh Bioscience’s new protein A affinity resin provides highcapacity capture of immunoglobulins from high-titer feedstocks. It binds human or mouse IgG, IgM, and Fab fragments. The resin offers high dynamic binding capacities (typically >30 mg/mL) over short residence times (typically two minutes) with fast mass-transfer kinetics and an improved alkaline stability (for cleaning in place). This can improve large-scale process economics by increasing throughput and robustness. Features: Bio-Rad’s Nuvia S cation exchange media are designed for high-capacity capture and polish steps over a range of operating conditions, easing scale up from laboratory to manufacturing processes. The media exhibit ultrahigh binding capacity over a wide range of pH, conductivity, and flow rates. Dynamic binding performance is 100–180 mg/mL for target biomolecules, and low backpressure can be used at fast flow-rates (>300 cm/h). At high monoclonal antibody loadings (100 mg/mL), 2.8and 1.7-log clearances of host cell protein and DNA, respectively, have been observed, with significant reduction of aggregates. Features: Alfa Laval’s expanded mixing portfolio includes a magnetically coupled levitating impeller. The magnetic mixers’ patented design delivers friction-free mixing, good cleanability, and safe operation even when dry. With dry running, these mixers can continue to blend until every drop of product drains from a tank, ensuring maximum yield. A unique eight-wing design efficiently mixes even at low speeds for gentle product treatment. Levitation makes it possible to mix at 10–600 rpm, allowing the same mixer to be used for both high-intensity and gentle mixing applications. Features: Themo Fisher Scientific expanded its S.U.B. stirred-tank single-use bioreactor line by adding a 2,000-L unit. 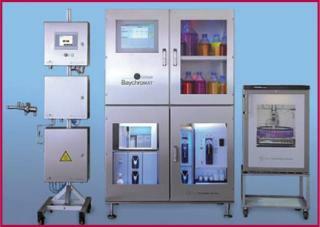 This allows scaling up of production working volumes from 25 L to 2,000 L using the same product line. The BPC bioprocess container system provides sterile contact surfaces for venting, sparging, mixing, and temperature sensing. A dual sparger allows efficient oxygenation and CO2 stripping. A 2,000-L water jacket with load-cell interface features a patented overhead mixing system, mixer motor, heating and cooling ability, and an external control system.